B&O Play launches first Bluetooth speaker with the BeoPlay A2 | What Hi-Fi? The wireless speaker market goes from strength to strength, with an increasing number of manufacturers looking to satisfy our demand for more freedom when listening to our music. B&O Play has become the latest audio brand to take its first steps into the wireless world, with the launch of its first ever portable Bluetooth speaker: the Cecilie Manz-designed BeoPlay A2. The launch of the BeoPlay A2 comes hot on the heels of another manufacturer making its debut in the wireless speaker market - with Bowers & Wilkins announcing its T7 speaker earlier this week. Due to go on sale on 3rd November for £300, the BeoPlay A2 features the aptX Bluetooth codec for CD-quality wireless streaming and promises "Bang & Olufsen Signature Sound" as well. According to B&O Play, its new speaker has a 24-hour battery life and can be fully recharged in just three hours. It delivers 180W of power and features True360 omni-directional performance. 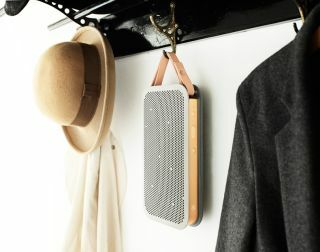 The BeoPlay A2 measures 256 x 142 x 44 mm and weighs 1.1kg. You'll also get a leather carry handle/strap, while three finishes will be available – black, grey/rose gold or green. Cecilie Manz said: "The fact that BeoPlay A2 was designed for a life on the go has influenced every aspect of the speaker in terms of its design. There is no front, there is no back - and there is no up or down, but there’s sound everywhere." B&O Play vice president Henrik Taudorf Lorensen added: "BeoPlay A2 is a ground-breaking product that will set new industry standards, thanks to the innovative True360 sound and the unprecedented 24 hours of battery life."